Around this time of year, I’m sure many of us spend more time and effort on skincare. As it gets chillier, my skin tends to get a lot more dry and flakey… (It’s gross I know) so, I thought I’d share my basic nighttime skincare routine! The first thing I do is cleanse my skin with water before I put on any type of product. Water helps to remove whatever your skin has collected during the day and it also keeps your skin hydrated. Next, I use a rose toner to leave my pores clean and to protect my skin. A tip I’ve used when applying my toner and essence is to lightly tap my skin. That way, you can make sure your skin is absorbing all the product. Also, I’ve learned to pull my skin up when applying products instead of dragging my face down. It helps to lift your face a bit believe it or not. Apply essence to hydrate the complexion of your skin… I generally use the same steps when applying toner. 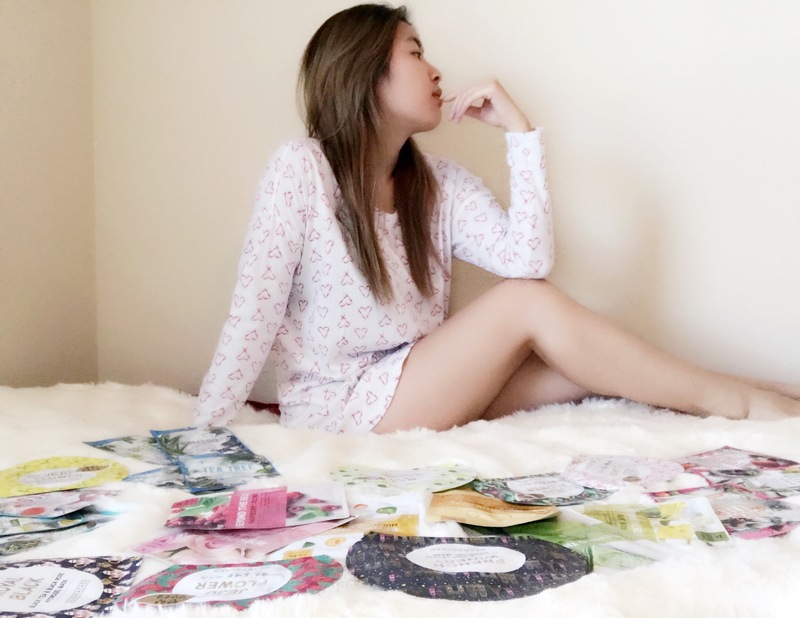 If I have time to spare or feel stressed out, I sit myself down for about 10-20 minutes to apply a sheet mask. Depending on what kind of mask you buy, there are different benefits. I generally like to buy whitening, hydrating, and anti-aging masks~ I try to use them at least once a day, or if I’m too busy, I’ll use them once a week. Lastly, you can pick whichever moisturizer works for you to keep all those skin products locked in. Let me know what your skincare routine is! Yea I use a lot of Korean beauty products, and of course! I’ll check out your blog as well! I have a Night time routine post scheduled too! Hehe. I used that charcoal face wash too, and it’s great!! O my look at that lovely collection of facial beauty masks. I want!!! Yes! Face masks are your skin’s best friend! I really need to find the time to do face masks again. How often do you manage to use them? I generally try to use them everyday but if I have a lot of homework I use them once a week! Aww thank you💕 it really does help a lot!